on one of our smaller country roads here in Stellenbosch. The farmer seems to be spraying the cows as they go from one patures to the next. He was in such a hurry and as there was a trafic jam behind me, I could not ask why. he is creating havoc! Lovely rural scene and processing. Wonderful capture and rural scene. I see the reason for him being in a great hurry. I hope the drivers weren't too upset about the wait and did not blow all their horns. I hate it when people do. 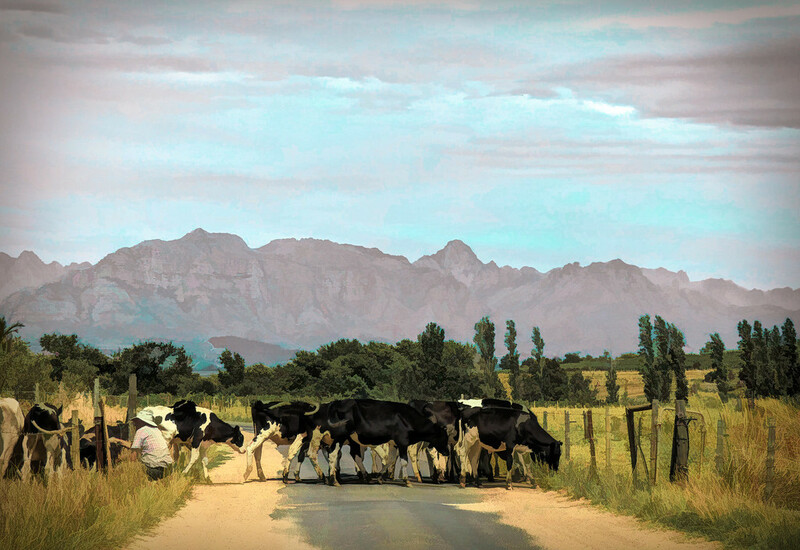 This looks like a painting, I had to look for the farmer because the first thing I saw were the cows crossing the road. Great capture. Maybe he was spraying them to get them to move faster. This is so awesome- great processing. I wonder why too . Lovely image... love the processing. Lovely scene, the cows seem to have all the time in the world! This is great - looks like a painting. Love it!